Use CB24 to test high-density flat cables with IDC wiremount sockets (0.025" wire centers, 0.050x0.100" pin centers). 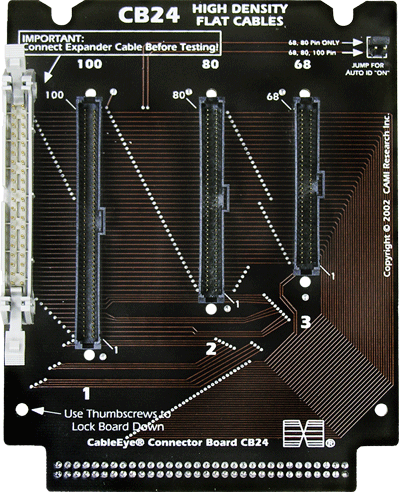 Four-wall headers for 100-pin, 80-pin, and 68-pin cables are provided on each board. Requires 256 test points; expansion module needed for use with Model M2 (Item 811) or M3 (Item 821). Bare board available for other large-format connectors that fit the 2-row footprint of these connectors; contact us for details and pricing for the bare board version. Set of two boards with expander cable.